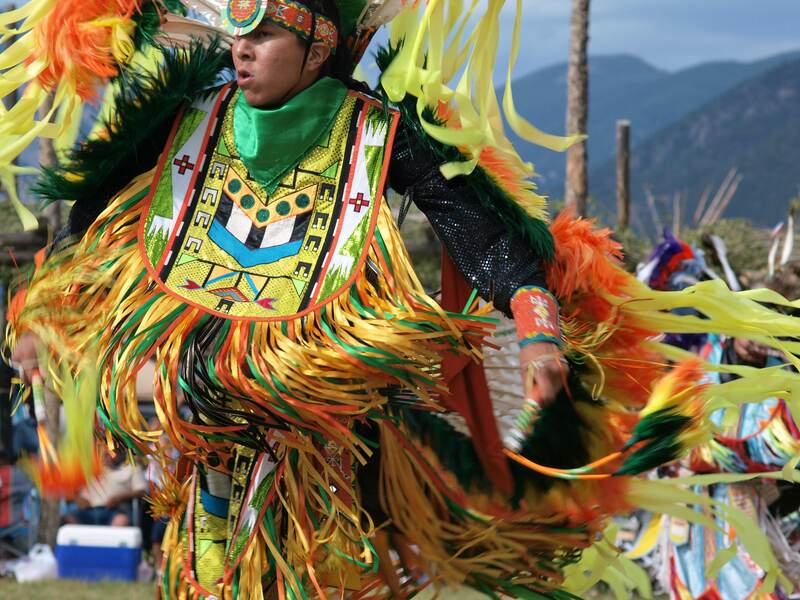 Last summer, I had the great privilege of attending the annual Taos Pueblo Pow Wow in northern New Mexico. The experience was so enthralling that I fell asleep that night with the beat of the drums still echoing between my ears. 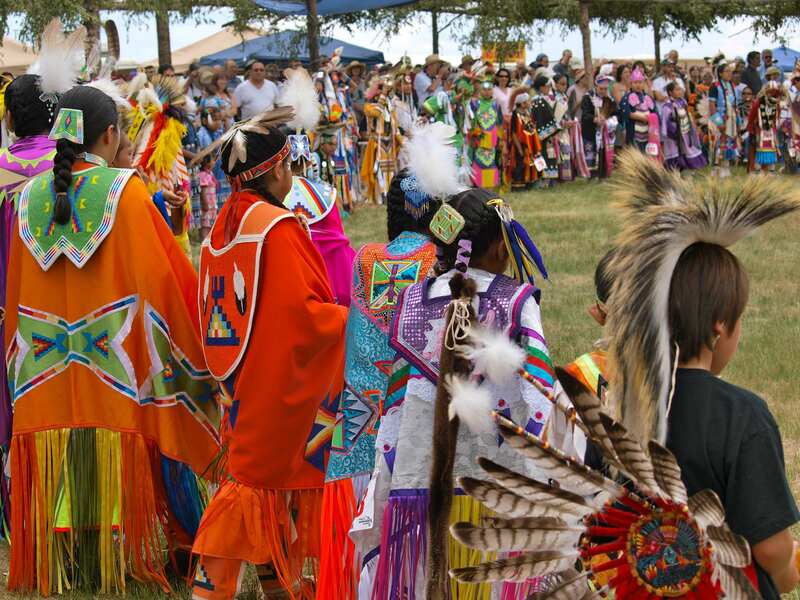 Mark your calendars: this year’s Pow Wow will be held July 13th through the 15th! Pow Wows are a celebratory gathering of Native Peoples that in modern times, have evolved into Intertribal dance competitions. 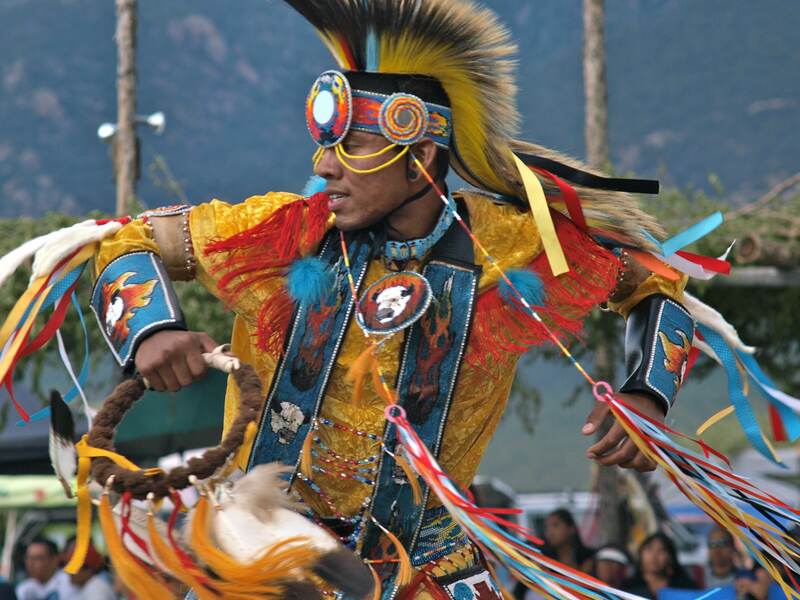 Many Pow Wows welcome the public and the Taos event is widely known for its stunning outdoor setting in the shadow of Mount Wheeler, New Mexico’s highest peak. 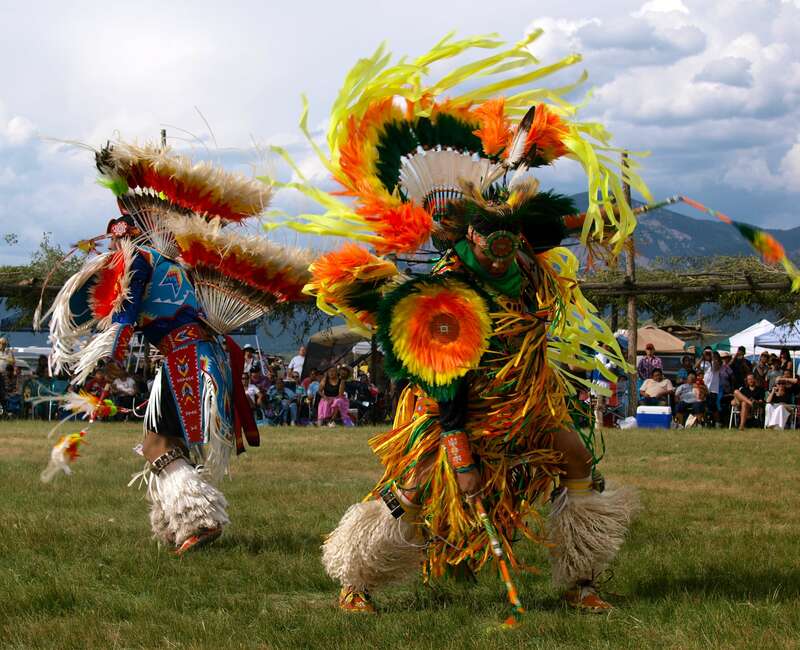 The Taos Pow Wow was advertised to begin at 1 pm “Indian Time”, which translated to about 1:20, with a Grand Entry of more than a hundred dancers – men and women of all ages in full regalia – followed by a free-for-all Intertribal dance and then drumming and dance competitions. And what regalia it was! Right off the bat, the announcer explained the dancers’ outfits were not to be called costumes. “Costumes are for halloween,” he said. “These are the real deal.” The detail, craftsmanship and creativity of the regalia worn by every dancer was exquisite; nothing less than wearable works of art. 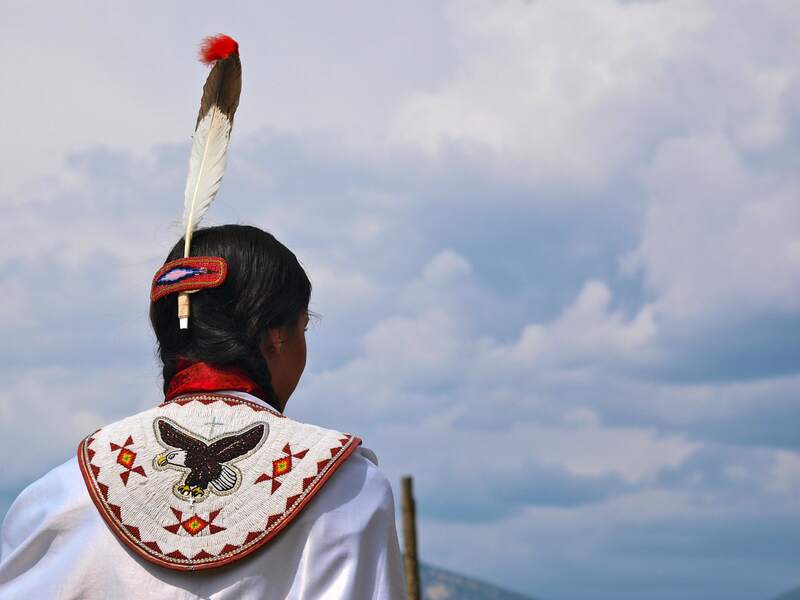 Many of the components of the regalia – including the eagle feathers – are handed down through families in ceremonies, one of which was held during the Pow Wow for a young girl who had a dream that she would become a celebrated jingle dress dancer. 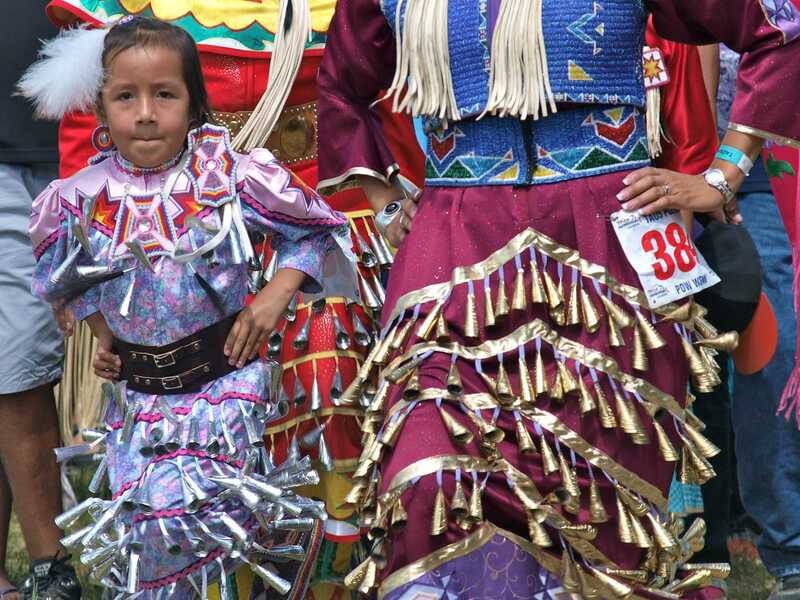 One of her grandmother’s feathers was given to her during a break in the dance competition and then she and her mother, a jingle dress dancer herself, led a procession of all the dancers around the circular arena. If I was a Native dancer, I’d want to be a jingle dress girl too. The sound of all those metal cones bouncing against one another is exquisite and although the dance itself is one of the more subtle, the motion and sound of the bells is mesmerizing. In addition to the jingle dress dance, the women also showcased the fancy shawl dance, buckskin dance, and so-called traditional dance (the links will take you to short clips I made yesterday of each of the dances). Women only began participating in powwows in the mid-1950’s, around the time when they began playing more active roles in tribal governance and fewer dances have been created to date, but each is unique and lovely. The men competed in separate categories called the grass dance, the fancy feather dance, the chicken dance (very different from that awful wedding dance and quite beautiful), the northern and southern straight dances and the traditional dance. Of the men’s dances, my favorites were the grass dance, the fancy feather dance and the traditional dance. Each of the dances is unique, with its own regalia, drumbeats and footwork. In all the categories participants are judged on their rhythm, balance, regalia and creativity. The grass dance involved very intricate footwork, while the fancy feather dance was a whirl of spins and leaps. 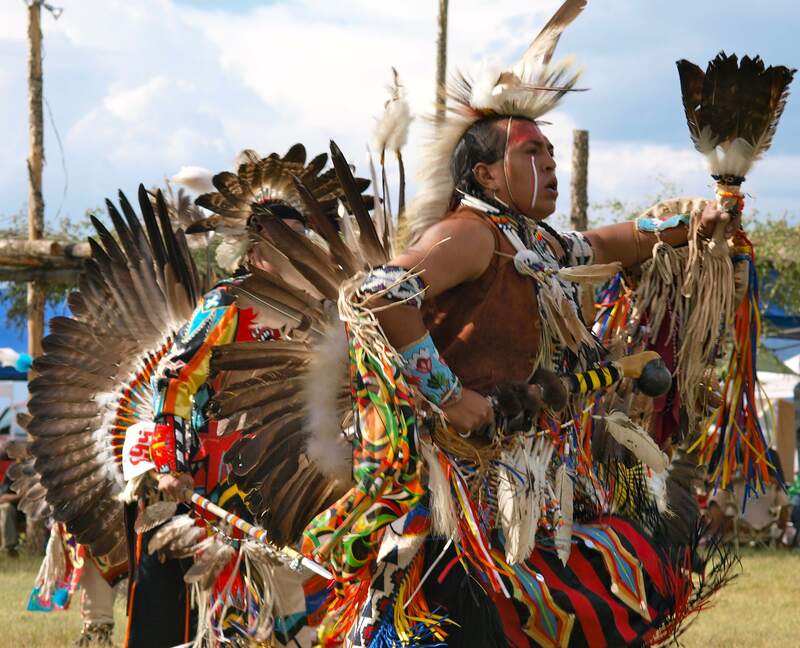 The traditional dance was somewhat more subdued than the flashy grass and feather dances, but the regalia was exquisite and the dances told fascinating stories of hunting game and tracking enemies. During the second men’s traditional dance (all categories danced two heats, back to back) one of the dancers lost an eagle feather and as soon as it was noticed, everything stopped. I don’t have any photos of this part of the day because at that moment, the powwow ceased to be a celebration and became a very solemn religious ceremony and the announcer asked us all to stand, remove our hats and to not take photos. Eagle feathers are sacred to Native Americans as they represent, among other symbols, their fallen warriors. When an eagle feather falls to the ground it must be cleansed before it can be retrieved, otherwise they believe they risk disgracing their ancestors and possibly endangering the health of the one who dropped it. To retrieve the feather, four veterans and a number of tribal elders surrounded the fallen feather, chanting and singing and dancing. Four times the veterans (from the Vietnam and Gulf Wars) laid their hands over the feather, before one of them finally picked it up. Then the announcer explained that whoever feels called to retrieve the feather must tell a story from battle that he has never told before. The man with the feather was given a microphone and he told a heart-wrenching story first in Tiwa, the Native tongue and then in English of a good friend dying in his arms in Vietnam. The response from the crowd was as moving as his story. Throughout the telling, which was laden with emotion and halted more than once for tears, the man’s tribal members called out their support and encouragement. Afterwards, the whooping, clapping and drumming was deafening as everybody thanked the veteran for his sacrifice, both in war and in reliving a painful story so that the eagle feather could be restored to power. The feather was then returned to the dancer, who looked on the verge of tears himself, over prayers from each of the four veterans and hugs all around from the man’s family. And then the party was back on. The announcer called for an impromptu Intertribal dance, where everybody dances all together and the joy and relief in the arena was palpable, even among the children. Of all the dancers, I think the children were my favorites to watch. Kids are natural movers and shakers and these danced with such spirit. Their regalia was as elaborate as their parents’ and their dances no less intricate or skilled. In New Mexico, we hear a lot of negative things about the opportunities available to Native children: poor schools, teenage abuse of alcohol and meth and the lack of career paths that don’t lead to casinos, to name a few. Seeing the Pow Wow kids take such joy in dancing and, at the same time, show such solemn respect for age-old traditions was truly profound. Those kids are being raised right and thanks to them, I have no doubt Pow Wows and other Native traditions will be around for a long time to come. 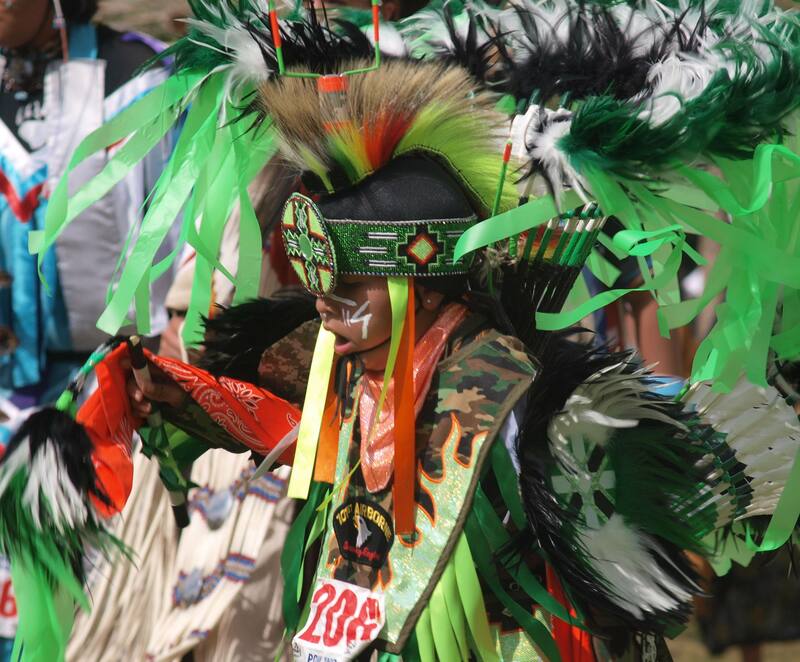 Click here to see lots more photos from the 2011 Taos Pow Wow and here for a schedule of upcoming powwows all over the US. Everybody should see a Pow Wow at least once in their lives! I hope to attend many more. 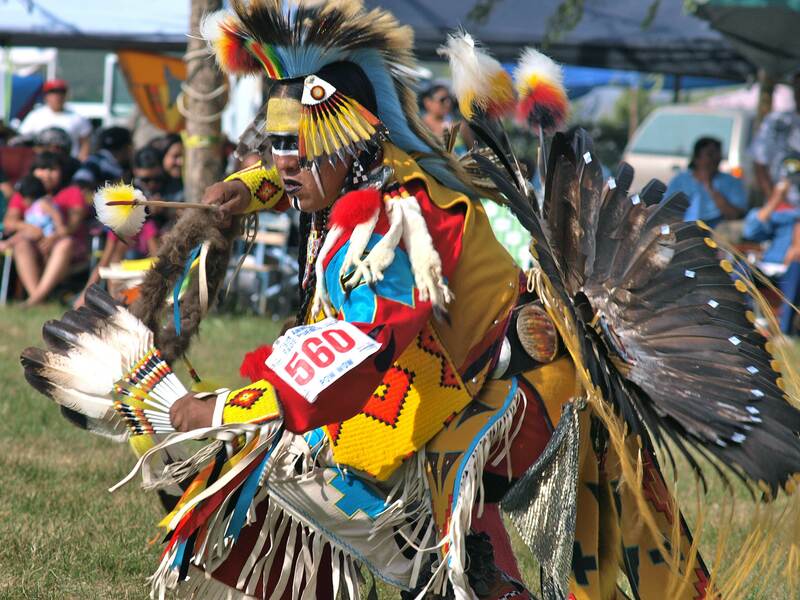 This entry was posted in New Mexico, Photography and tagged dancers, Native Americans, powwow, pueblo, regalia, Taos. Bookmark the permalink. Wonderful coverage. Moving. Thanks for sharing. I went to the Taos Powwow in 2004, would love to go back. Your photographs are gorgeous, full of movement and life. Very colorful and action packed. For as long as I remember I have been interested in Native Americans.Your photo’s are superb as good as I have in my many books.Many thanks. Taos is a magical place anytime. Pow-wow time increases the energy a million fold. 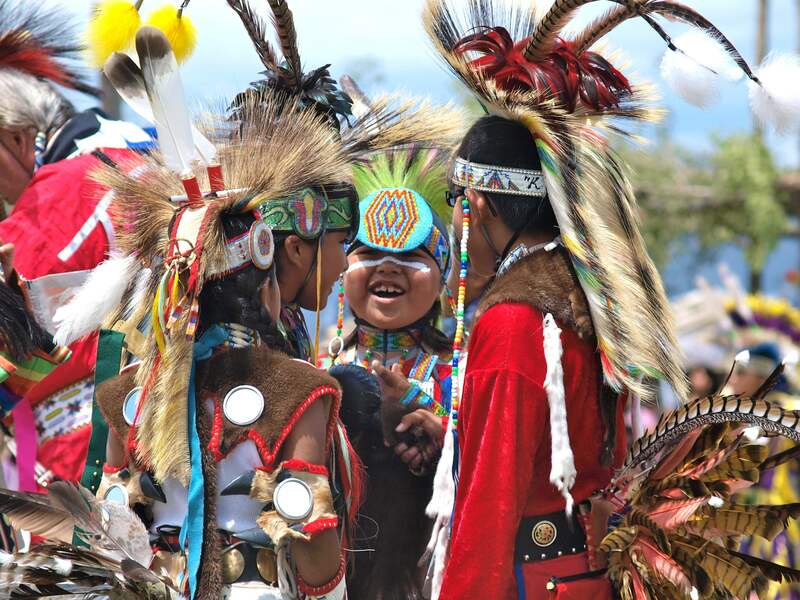 Beautiful pictures- particularly the pow-wow kids. Simply stunning photography and interesting insights. I learned something new. Thanks so much for sharing. Found your blog via the Earth Day email from Word Press – so glad to learn about you. These photos are beautiful! You have a real talent. Wonderful photo, thank you so much for sharing this.